Life as a baby vampire can be pretty difficult. For one, they don’t yet have any fangs to sink into their victims. They aren’t allowed to climb up the stairs, let alone fly off into the night unsupervised. It’s nearly impossible to hypnotize someone when they can’t even say “mama” yet. They get distracted by shiny objects or jangling keys. And that 7 p.m. bedtime really makes it difficult to mingle with the children of the night. But there are some advantages. If they don’t hunt down any tasty blood for themselves, there’s always a warm bottle of milk available. They get to sleep in a crib, which is way more comfortable than a coffin. And they have a potent secret weapon for luring in prey… They’re so darn adorable. Who could resist that? 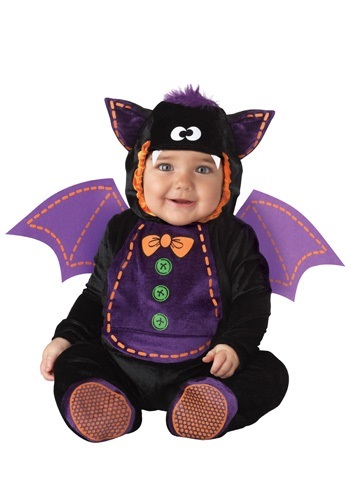 That’s especially true thanks to this Tiny Bat Infant Costume. The black velvety jumpsuit features a purple panel tummy, detailed with screen printed orange stitching, green buttons and an orange bowtie. It snaps in the back for easy wear and comes with skid-resistant purple feet with orange grips. There’s also a bat hoot with purple and orange details and a purple tuft of fur, along with detachable purple felt bat wings with orange stitch marks. This costume is sure to transform any baby into the most adorable vampire the world has ever seen!